I've been trying to fix an issue where my 2080 Ti Black goes to 100% fan speed and then backs off again at 74-77C. I tried setting a specific speed percentage manually, and it still hits a certain temperature where it forces 100% speed. Then, I tried a fan curve. Both of them work up until a certain temperature, and then the card seems to force 100% speed regardless of what I have set. What is going on here? It's incredibly obnoxious, unacceptable, and I've never had a card behave this way. If you have the xc black I would suggest loading a different vbios to the card to see if that helps fix the issue. It's not an XC Black. Best suggestion would be to try and reflash the original vbios to see if that may help fix the problem. Where would you even go about getting the original vbios? Also doesn't messing with vbios also mess with warranty? 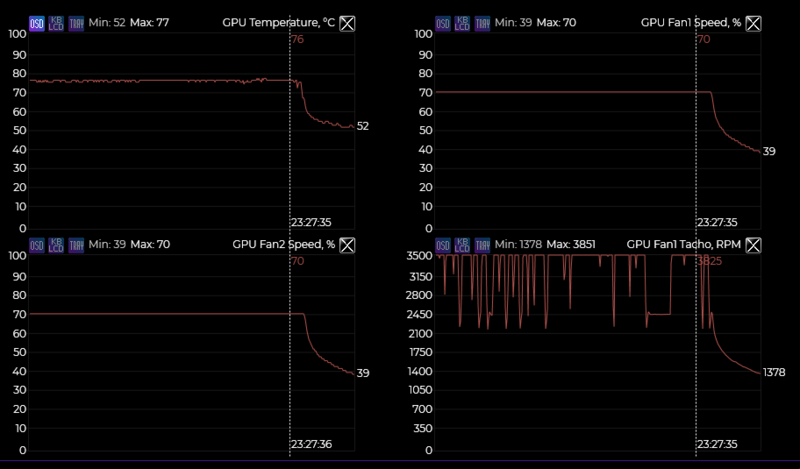 I swapped PCIe slots and reseated power cables and now it seems to have decided to ramp the fans up to max at 80C, which is still kind of nonsense. It should throttle the card before it tries to override the fan settings. You can contact evga support, and they can help you reflash the vbios, or you could try reflashing the vbios yourself with nvflash. Reflashing the vbios with the orignal .rom will not affect the warranty at all.